Second Ward High School Foundation - Membership and Hall of Fame Contributions﻿Many alumni and family members choose to become part of The Hall of Fame. These supporters of the House/Museum have given a minimum of $1000. When you contribute on this level, your photo is permanently displayed proudly in the House on Beatties Ford Road and you are honored during the banquet at the foundation's Annual Meeting and Reunion. 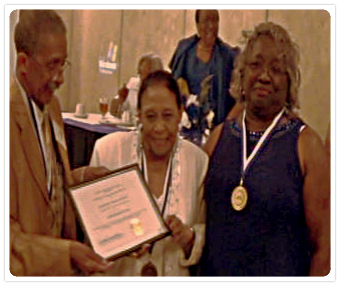 During the 2010 Annual Meeting and Reunion, the Second Ward Foundation honors the annual inductees tothe Second Ward Hall of Fame. 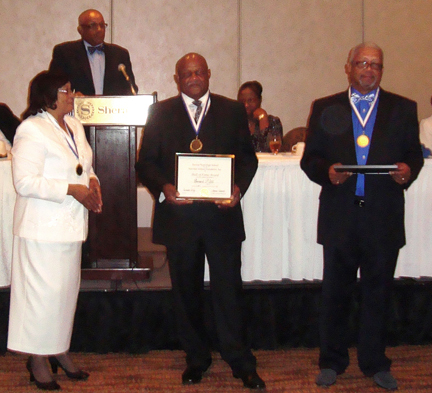 Pictured at left, banquet Master of Ceremonies Leon watching his sister Diane Gill Pate, both previous members of the Hall of Fame, recognize their two brothers, Bernard and MichaeGill, the new inductees. Many alumni and family members choose to become part of The Hall of Fame. These supporters of the House/Museum have given a minimum of $1000. When you contribute on this level, your photo is permanently displayed proudly in the House on Beatties Ford Road and you are honored during the banquet at the foundation's Annual Meeting and Reunion. two brothers, Bernard and MichaeGill, the new inductees. 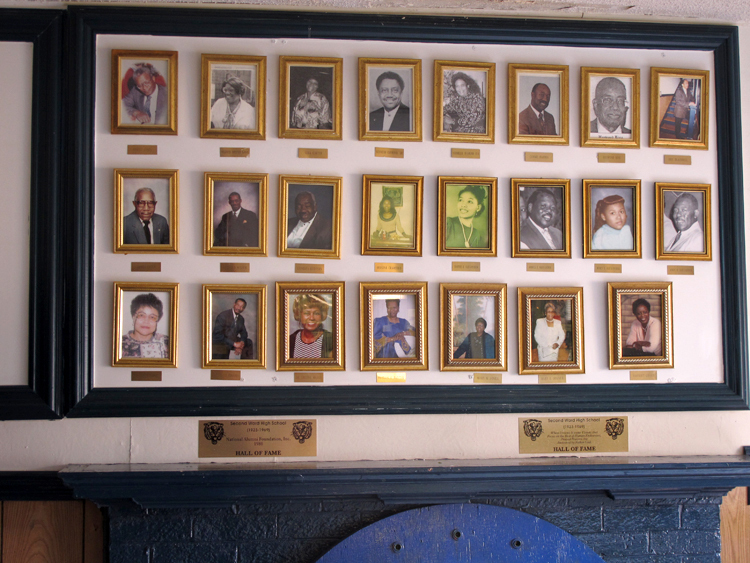 Ernest Cohen, Sr., Mildred Baxter-Davis, Lula Carter, Kenneth Diamond Jr., Vermelle Diamond Ely, Connie Patton, Heywood King, Obie Blackwell, James Grier, Leonard Miller,Sr., Charles Redfern, Beuline Alexander Crawford, Hattie Alexander, James E. Alexander, Mary Alexander, John R. Alexander, Doris Holsey Campbell, Dr. Earline Majors Patrick, Phyllis Ann Baxter, Mary Martin-Jones, Dr. T. Wilkins Davis, The Honorable Warren Turner, Bobby Drakeford, Leon S. Gill Sr, Marcella Digsby Williams, Michael Pate, Diane Gill Pate, Sam Brooks Jr., William "June" Gill, Bernard Gill, Michael Gill, William U. Harris, Clara Woodley, Theodore Kennedy, Woodrow Johnson, Delores Giles, Arthur Griffin, Cecelia Johnston, Delores Foster, Gwendolyn Lucus, Price Davis, Bessie Sigler and Willie Mae Sanders Wyche. 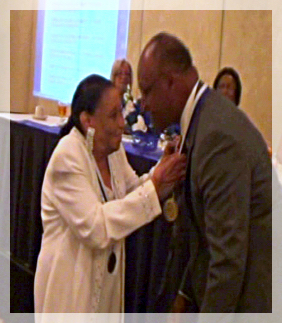 Vermelle Ely gives inductee Ted Kennedy his Hall of Fame medallion at the Annual Meeting. New Hall of Fame member Bobby Drakeford (third from left) made a significant donation to the Foundation. Alumnus Michael Pate (fifth from left) created the new signage at the House/Museum located at 1905 Beatties Ford Road. Pictured also are board members Price Davis, Mary Jones, and archivist Vermelle Ely.